Orange homegirl Laureen Froemke brings fashion-forward finds to her newly opened Zae’s Boutique in Old Towne. She is pictured here with her cousin, Michele Qualls (right), who helps her manage the shop, which is located at 140 South Glassell. A longtime resident of Orange, Laureen Froemke has longed dreamed of opening a women’s apparel boutique in Old Towne. That dream is now a reality with the recent grand opening of Zae’s Boutique at 140 South Glassell. After outgrowing her former shop in Anaheim Hills, Laureen thoroughly transformed her new space previously occupied by Old Towne merchant, The Charming Shoppe. 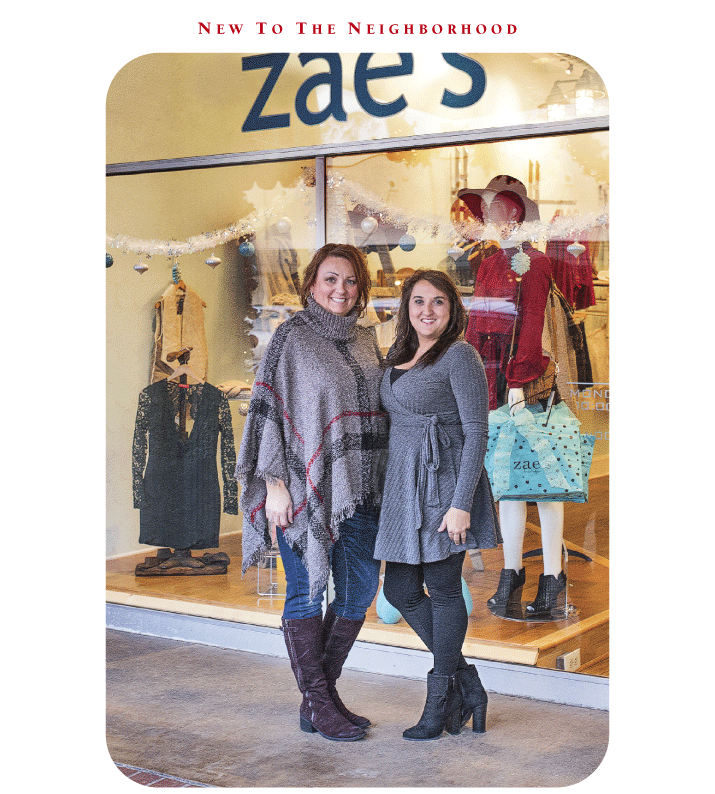 Showcasing new dressing rooms, wood floors and attractive lighting, Zae’s Boutique conjures an antique “vibe,” while providing a soothing backdrop for the great selections of fashion-forward finds. In addition to apparel, Zae’s Boutique offers hats, shoes, scarves, lingerie, jewelry, handbags and more. There’s also a selection of home accessories, like wine totes, candles, pillows, blankets and decorator items. “Smuggle Your Booze” stealth flasks are just some of the seasonal “gag” gifts on display. Laureen says her store is unique in that she offers only six pieces at one time of any given item. Her customers appreciate the opportunity to find unique outfits by designers that Laureen has worked with for the last six years. Laureen isn’t the only member of her family to own a business in Old Towne. Her husband’s venerable Truck Shop Car Shop on Batavia is a fixture in Old Towne for more than 30 years. According to Laureen, the boutique was once the lobby of the old movie theater in Orange. When renovating the interior of the space, she uncovered original windows from the historic building that were stowed above the ceiling.